• Fight off a zombie attack with a 3D motion interactive game at 7D Experience! • Rub elbows with the A-listers at Madame Tussauds world-renowned wax museum! 7D Experience is an arcade featuring 3-D games in theaters with roller coaster-style motion. Your first challenge will be the thrill of a rollercoaster and the excitement of a laser blasting game in this 3D motion experience. All your senses will be engaged in competition to stop the mad Dr. Wolf from turning London into a city of werewolves, blast your way through a post-apocalyptic wasteland, or deal with the zombies that are creating havoc. After, you will put your agility and speed to the test and navigate through a web of laser beams. You can work as a team to race against the clock or compete against your friends. These exciting games are perfect for all ages! GoCar is the first-ever GPS-guided Storytelling car ® that will take you on unique sight-seeing adventures. The tours are custom designed and will guide you through the city’s iconic landmarks while narrating the rich history. This one-hour tour will take you through the culturally fascinating Chinatown, the iconic Downtown Union Square district, the historic North Beach neighborhood and bustling Fisherman’s Wharf. 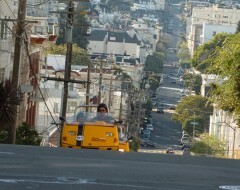 You can also create your own route and hit the highlights off your San Francisco must-see list! Madame Tussaud, a skilled wax artist, shocked curious onlookers in the early 19th century with her display of gruesome relics of the French Revolution. Today, there are over 20 Madame Tussauds wax museums in the world in her honor. San Francisco’s features an interactive city zone where you can walk the Golden Gate Bridge and sing with Tony Bennet down Lombard Street.